Boston cycling advocates are pressing city planners to do more to protect cyclists from motorists – and commercial truck drivers in particular – from veering into the bicycle lanes. This concern has grown especially sharp as students recently returned to classes, and many opt to bike to and from classes and part-time jobs. Not only that, but students returning to classes in droves, moving trucks in tow, have created a hazard for cyclists when those trucks park in bike lanes. Boston is known as a community with narrow streets and tons of double parking. Those on bicycle say it’s not uncommon to have to veer in and out of regular traffic to try to get around the motor vehicles parked in bike lanes. It creates a perilous situation for them. Bolster enforcement so violators face immediate and sharp consequences. Recently, the Globe looked on as an architect in Cambridge, critical of what he perceives as the city’s too-slow response to prevent Boston bicycle accidents, took matters into his own hands. He took three, bright yellow posts, each 42 inches tall. He placed them along Beacon Street to prevent drivers from parking in the bike lanes. Police officers who happened upon the posts weren’t sure who posted them, but they didn’t move them. They remained there for the larger part of the day, and drivers stayed out of the bike lanes. He called the solution, “crazy simple” and said his experiment proves the city doesn’t have to spend a ton of money to improve cyclist safety. A spokeswoman for the city’s transportation department said the city does impose $100 fines on motorists who park illegally in Boston bicycle lanes. The city also routinely inspects bicycle lane markings to make sure they are obvious and visible and that “No Parking” signs are installed in or near bike lanes across the city. Additionally, she said the city is planning to install posts along the Beacon Street bicycle lane (a common site for bicycle accidents) that would serve to keep bikers separate from regular motor vehicle traffic. More protected bike lanes are also planned on Massachusetts Avenue and Commonwealth Avenue, which are also hot spots for bicycle accidents. A fatal bicycle accident at the corner of Beacon Street and Massachusetts Avenue in August 2015 prompted city officials to create a protected bike lane with posts for a small stretch. Still, blocked bicycle lanes continue to be a serious problem, especially on roads that are narrower or have a number of commercial businesses that require trucks to pick up or deliver goods. Also, the popularity of Uber and Lyft has meant that many of these drivers use the bicycle lanes to pick up and drop off passengers. Police working for the Boston University Police Department installed cones outlining the bike lanes on Commonwealth Avenue, stopping cars and trucks from using the lanes to drop off students. Meanwhile, the Boston Police Department said it’s stepped up its enforcement of violations. 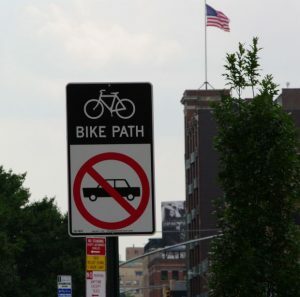 Four years ago, 1,415 citations were issued for illegal bicycle lane parking. This most recent fiscal year, it was 2,221.